But Flora is not like other bees. Despite her ugliness she has talents that are not typical of her kin. While mutant bees are usually instantly destroyed, Flora is removed from sanitation duty and is allowed to feed the newborns, before becoming a forager, collecting pollen on the wing. She also finds her way into the Queen’s inner sanctum, where she discovers secrets both sublime and ominous. But enemies are everywhere, from the fearsome fertility police to the high priestesses who jealously guard the Hive Mind. And when Flora breaks the most sacred law of all her instinct to serve is overshadowed by an even deeper desire, a fierce love that will lead to the unthinkable . . .
Laline Paull’s chilling yet ultimately triumphant novel creates a luminous world both alien and uncannily familiar. 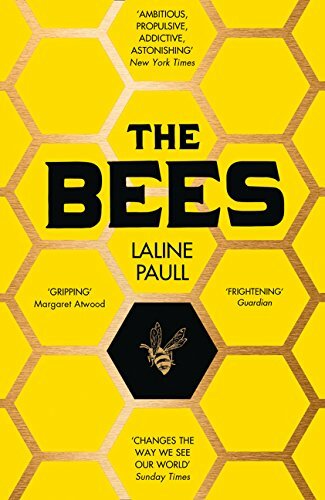 Thrilling and imaginative, ‘The Bees’ is the story of a heroine who, in the face of an increasingly desperate struggle for survival, changes her destiny and her world.